Good news, we have heat. We even have heat in the adult stacks which has proven challenging over the years. Last week was a big week. The Wardell room, former kitchen area, utility room and bathroom were gutted to form one large space. 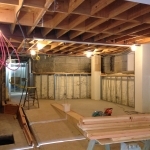 This space will become the new children’s library with some space shared with the Wardell Room. In this new configuration, the Wardell Room will be able to expand as needed. 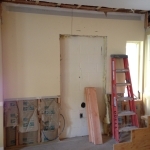 Space for a new handicapped accessible bathroom was created and framed in. Today, cuts were made for new windows and doors on the lower level. Work has been moving along on the lower level. Holes have been cut for new doors and windows. Wiring has been put in for computers, phones and lighting. Radiators and other heat sources have been installed on the lower level. This week was a big step – the hole for the new stairway has been cut. You won’t see it on the main floor because a large box was built to cover the opening. We apologize for the noise but noise is unavoidable when cutting through concrete. The windows on the lower level have been added bringing beautiful natural light into the future home of the children’s library. The walls have been sheetrocked, the concrete base of the stairway was poured and the bathroom walls were completed. Work will resume in January. We will be closing the main floor of the Library on January 25. Once work has been done and a temporary certificate of occupancy granted, we will open in temporary quarters on the lower level. We will have all our new books, DVDs and audios for adults, a selection of children’s books, computers, printer, copier, newspapers, magazines and our lovely staff to help you. We hope to open on the lower level on February 16. From then until our grand reopening, you may request items from other libraries for pickup at SML in addition to borrowing from our temporary collection. We are very excited about the work being done at the Library and hope to make the construction process as smooth as we can for you and for us. If you have questions, please give us a call and we will do our best to meet your needs. February was a very busy month. We were preparing to open our temporary library on the lower level. This meant we had to clear out the main floor so that construction could shift from downstairs to upstairs. Construction also had to be completed on the lower level to allow us to move downstairs. Our collection was moved to storage and furniture given to other libraries and Friends of Kenya. We were ready to open on the lower level the first Tuesday in March. We continue to raise funds for this project and are very close to our goal. Many thanks to all who have participated. We opened our temporary library on the lower level, Tuesday, March 1. We have a beautiful, open, bright space for you to enjoy. New items are available immediately for you to check out and take home. You can see a preview of our new non-fiction arrangement. If you are looking for an item from our stacks, we are happy to request it on interlibrary loan for pickup at the Library. Our programs continue in town hall and at the Congregational Church. We are thankful for their help during this time. During this time, the staff is working hard every day changing to a more bookstore like arrangement. Instead of using numbers, 641.5, to indicate a subject area we are using words, such as Cooking Vegetarian.